Keilah Allen is swapping out a semester at Cleveland State University to spending her spring studying abroad in Accra, Ghana and she’s taking her love for rugby with her. 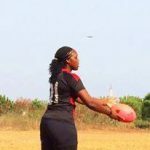 Keilah was the only woman playing on the all-men’s rugby team in Ghana, and we had the opportunity to chat with her about it! 1. Why did you end up choosing Ghana to study abroad? I chose to study abroad in Ghana because of its rich history and culture. My mother specializes in African history, so growing up I was taught a lot about the country. I have always dreamed to visit cape coast slave castles and many other popular historical sites. The country’s history of being one of the first sub-Saharan colonial countries to gain its independence and experiences very few episodes of political chaos is pretty impressive. 2. 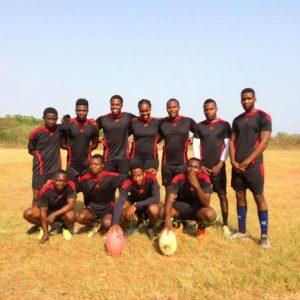 Was playing rugby something you had thought about before arriving in Accra? 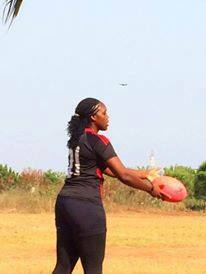 I honestly didn’t prepare to play rugby prior to arriving in Ghana. I knew I could watch a couple of matches in person and on television, but I didn’t bring any rugby gear. Since the popularity of the sport for women around the world is still growing I didn’t expect to play. 3. Rugby isn’t new for you, but what was it like playing in Ghana compared to back home? I would honestly say playing in Ghana compared to back home is 100 times better. It’s a wonderful experience and it makes me feel great. The training is more intense. I have learned a lot from the coaches and players, and have created a very strong bond with my rugby brothers and sisters. Keilah and the rest of the rugby team. 4. Can you tell us what it was like to approach the team to see about playing rugby? During our orientation day we were told about all of the sports that the university took part in and the list was extensive. I was excited to see that rugby was part of it, however, I was still a bit uncertain if they had a women’s team I could play for. Nonetheless I decided to ask at the end of orientation. I met with coach Jafaru and he gave me a list of numbers to contact if I was really serious about playing. I started training with the women’s coach every morning at 6am. I was the only one coming for the women’s training. It was difficult to pull together enough women on campus who were interested in playing. Two weeks passed, it was still one on one training. My love for rugby gave me hope and training was a good way to stay in shape whilst abroad. One Saturday morning I came for training early. Coach Abigale had not arrived yet, but the guys were on the field running steep lines and working on passing. I asked to join them in their training Jafaru agreed as long as there was just contact and no tackles. In the beginning it was uncomfortable for them to practice with me in fear they would hurt me. Once I gave my first tackle they knew I was something serious. After that day I started training with the men’s rugby team and featured in the first two interhall games and so on. 5. How has your experience on the rugby ground shaped your experience off the field? 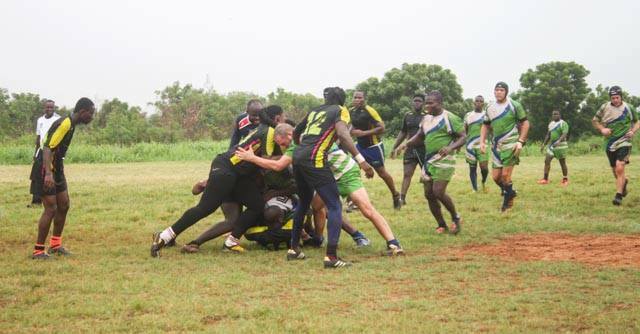 Playing rugby in Ghana with the coaches, team captain Glen, and the rest of the team has definitely molded me into a better person mentally, physically and emotionally. All of my team mates and coaches have taught me so much about rugby and how it can be applied to life. Rugby teaches dedication, determination, how to channel frustration, and how to work as a group. The sport focuses a lot on support and team effort without the squad it is impossible to win the game. In the game of rugby we pass the ball backwards to our supporters and they move the ball forward. This technique can be applied to real life situations, for instance sometimes in life we feel as though we are stuck in one place, and there is no way for us to move forward. During these times it is better for us to take a step back into the past to figure out why we are stuck in order to move forward. Keilah was interviewed on national television for her position on the all-male team. We heard you were featured on national TV – what was that like for you? It was really exciting I am the first girl at the University of Ghana to join an all-male team. I was projected as a warrior kind of lady and honestly, that felt good. I went shopping at Accra mall the next day and two people approached me telling me they saw me on the news. 6. Any advice or tips for students looking to join a club at the University of Ghana like you did? Any tips for those interested in playing rugby in particular? I would advise them to just go for it, you build a lot of connections and meet a lot of great people. 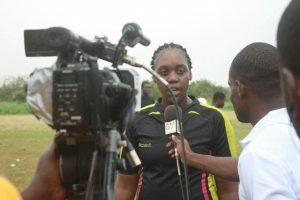 I am also part of Ghana volunteer team and I got to experience many great times with the volunteer club and rugby squad. For the students interested in playing rugby I would advise them to read up on the sport, watch a couple of games and don’t be afraid to dive in. Rugby is truly a great sport and very enjoyable if you play by all of the rules. I can promise you once you start playing it will be extremely difficult for you to stop. Extended Summer Session I application deadline is May 1st. Summer Session II application deadline is May 1st. Fall Semester application deadline is May 1st.